Guess the Wrestlers trivia by this WWE Wrestling Quiz Games free! Fan of pro Wrestling sports of wwe network like smackdown live, tna, raw, wcw NXT, NXT UK, ECW, AEW wrestlemania and Ufc Fight night Champions? Guess all the pro wrestling superstars, wrestlers, fighters, WWE Superstars, Total Divas, Bellas, Legends, and champion wrestlers of hall of fame of 80s 90s 2000s & stars like The Undertaker, Stone Cold Steve Austin, Brock Lesnar, John Cena, Dean Ambrose, The Rock, Roman Reigns, Eddie Gurrero, Shawn Michaels, Hulk Hogan, Triple H, The Miz, Seth Rollins, Big Show, Chris Jericho, Randy Orton, Kane, Paige and other super stars? This wwe quiz games will test the knowledge. love USA wrestling? then this pro Wrestling Quiz – Guess the wrestler game is for you!!! Play this WWE trivia guessing game for guess the wrestlers of WWE RAW and UFC fighting via different puzzles, quizzes and wwe trivia questions in this WWE Wrestling trivia. •	Guess the wwe superstar from 80s 90s 00s & Current wwe stars in this pro wrestling quiz game. •	Wrestlers legends from word wrestling, past and present and some world famous wrestlers. •	Guess the wwe superstars from wwe world heavyweight championship and wwe raw. •	Wrestling super stars from AU, UK, CA etc. 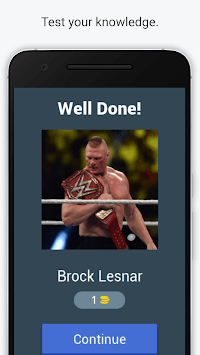 •	Puzzle based free wwe quiz game UI for wwe trivia game. •	Unlimited update for pro wrestling super stars ultimate trivia quiz via internet. •	Find 1980s 1990s and current wrestling super star from wwe network in this free wwe quiz game. Wrestling Quiz game is easy to play. Reveal tiles and uncover pro wrestling super stars. Then guess the wrestler legends by the pic & provide answers. 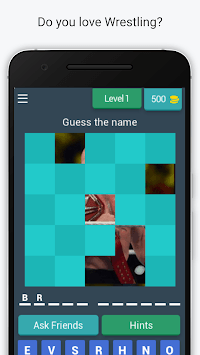 Tap letters to write the name & guess the picture of the wrestler to earn coins. stuck on a puzzle? use hints or ask your friend via message. Play the wrestling icon quiz online or offline. More wrestlers and female wrestlers is in high levels of this Wrestling Quizzes trivia. Upcoming 500 wrestler image 2k19. Play wrestling quizzes games with friends, family and kids who loves Wrestling Quizzes and Guessing games. Challenge with your wwe quiz games scores. *Unofficial Application – this “WWE Wrestling Quiz - Guess the wrestler trivia” is not an official application of WWE RAW , UFC and not in related to World Wrestling Entertainment Inc and Ultimate Fighting ( UFC ).